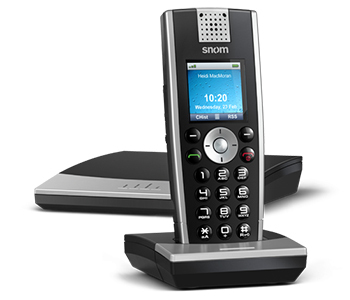 The snom m9r is the next generation snom DECT handheld that combines the convenience of wireless communication with the widely accepted benefits and feature richness of Voice over IP telephony and excellent speech quality through digital cordless audio. By combining functions of business communication with the ease of use of consumer products, the snom m9r is ideally suited for professional and private use alike. With its illuminated keypad and TFT color display, the snom m9r provides the perfect blend of mobility and accessibility with features such as hands free mode, calling line identification (CLI) by displaying name, number and image of the caller as well as typical mobile phone features such as address book, calendar, calculator and alarm function. The menu driven graphical user interface allows intuitive use of the handset via five navigation keys. The snom m9r provides interference free communication by making use of the dedicated DECT frequency band. In addition, the snom m9r delivers the typical benefits of the DECT world such as high standby time and superior speech quality in addition to internet application integration, thus providing a decisive edge over WLAN-based handhelds. The access point covers roughly 50m (150 ft) indoors and approx. 300m (1000 ft) outdoors (depending on the actual topology of a building and/or outdoor premise). Users requiring mobility in larger buildings can pair the snom m9r with a DECT repeater to extend the signal coverage according to their needs. In this configuration, the DECT handsets registered to the base station can be used in both the base station and the repeater coverage area, thereby providing users with greater freedom of mobility. The snom m9r delivers pre-configured PBX profi les, allowing it to be employed in parallel with the most popular SIP platforms with the click of a button and making the seamless integration into most VoIP environments possible. And last but not least: The USB interface and the large flash memory provide an excellent potential for future enhancements. Download the YipTel Snom M9R HD Datasheet (PDF).